Serena Williams was left all alone trying to crush an unlikely uprising on Wimbledon's hallowed lawns on Tuesday as sister Venus and Kim Clijsters suffered shock defeats in the women's quarter-finals. By the time defending champion Williams stepped on Centre Court before beating China's Li Na 7-5, 6-3, Venus had been thumped by Bulgaria's Tsvetana Pironkova and Clijsters, seen as the main obstacle to another Saturday sister act, had crumbled to a three-set defeat against 21st seed Vera Zvonareva. World number 82 Pironkova, who charmed the Court One crowd during a dazzling 6-2, 6-3 defeat of Venus, will face 21st seed Zvonareva in the last four with the prize of a first appearance in a Grand Slam final tantalisingly close for both. Serena, now overwhelming favourite to claim a fourth Wimbledon title and a 13th major crown, will direct her considerable firepower at Petra Kvitova in the other semi-final after the unseeded Czech saved five match points to beat Estonian qualifier Kaia Kanepi 4-6, 7-6, 8-6. On a day of surprises it was Pironkova who stole the limelight as she inflicted a worst ever Wimbledon defeat on five-times winner Venus to become the first Bulgarian to reach a Grand Slam semi-final in modern times. Afterwards the 22-year-old summed up exactly what it meant. 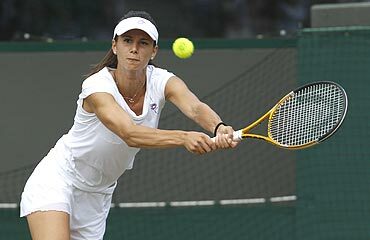 "Wimbledon has always been like a religion to me," Pironkova, whose greater variety of shot completely nullified Venus's power advantage. "I don't think it's just for me. I think it's for all of the players. Because Wimbledon is the first tournament. It's the oldest tournament. Growing up, every player is looking at Wimbledon. That's like a dream," she added. 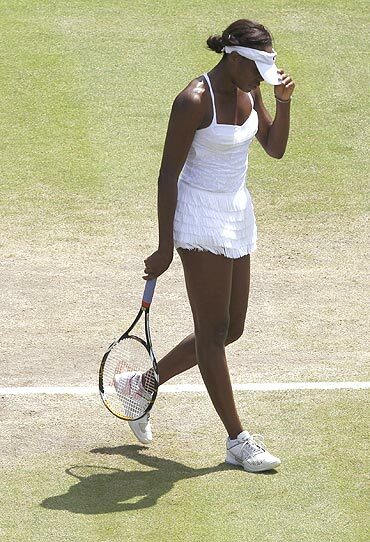 Venus, 30, won the singles here in 2007 and 2008 before relinquishing the trophy to Serena last year. Her task now will be to carry the form she showed on Tuesday into the match against Zvonareva, one of the less celebrated of the Russian brigade that has invaded the latter stages of grand slams for the past decade. "I can say that I'm ready," she said. 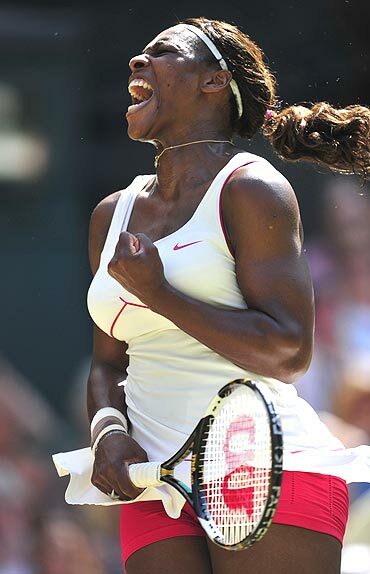 "I beat Williams once before, at the Australian Open and there was so much attention. I was shocked then and (in the) next match, I just couldn't focus. I think I've learned my lesson," he added. A rather sour Venus offered scant praise to her opponent as she contemplated another disappointment after her third round defeat at Roland Garros and a quarter-final exit in Australia. "I just didn't get enough balls in today," she said. "I just let it spiral and didn't get any balls in. Obviously she's played well to get this far, but I don't think I did anything right today," she added. Her comments did not do justice to the play of Pironkova who took the first set with a stunning backhand pass and then resisted a mini-revival from her opponent early in the second set to move 5-2 in front. The cheers for Pironkova's victory could be heard over on Centre Court where Belgian mother Clijsters was already staring defeat in the face against Zvonareva. A Clijsters v Venus semi-final had seemed a certainty as crowds filed in through the gates on a slightly cooler and breezy day in south west London but, as at the French Open this month, the women's Tour is proving highly unpredictable. Having bagged the opening set after the first six games were shared, Clijsters lost her way and allowed herself to be pushed around by the Russian who peppered the corners with some powerful, grass-scything groundstrokes. Clijsters, who quit the game in 2007 to start a family and was hoping to mark her popular return to Wimbledon with a fairytale title, was strangely subdued and her forehand fell to pieces as Zvonareva stormed back to win 3-6, 6-4, 6-2. "I think I played tactically better, and I was able to hang in there," the 25-year-old Zvonareva said after choosing the perfect moment to beat Clijsters for the first time. Women's tennis would appear to be in a state of flux at present with many of the big names out of form or struggling with injuries. Only two of the top eight seeds reached the quarters here but at least Serena is firing on all cylinders. The 28-year-old served 11 aces in a high-quality contest against Li to take her tournament tally to 73 and she now looms like a colossus over the three other women left. She has 12 Grand Slam titles to her name from 15 finals and has appeared in 18 semi-finals. Zvonareva has just one appearance in a major semi to her name while the other two are in uncharted waters. "It's not mine to lose, it's mine to win if I can get it," Serena said when it was suggested she only had to turn up in her next to matches to win a fourth Wimbledon singles title. "There's three other people that are vying to win it. They have just as good a chance as I do," she added. Kvitova, 20, will have to play like another Czech left-hander, Martina Navratilova, to stand any chance although she hardly sounded optimistic. "No, I don't think. I don't think so, no," she said when asked if she can win the title.